Indian economy is endangered by sudden fall of rupee per dollar. This decrement trend is not the western policies or some international pressures but it the outcome of monetary misconduct as experts says. This disturbance adversely impact on the inflation rate and steep rise of the prices of domestic oil, electronic and other products. When it is appraised the rising trend of USD, in the month of June’ 2013, it touched to Rs. 60/- per dollar. Financial experts fear that this situation may create panic and disturb the populace of India. Many groups such as importers, travellers who want to go abroad, or students on foreign education are greatly affected. The record low of rupee affects every group of society because it is major cause of inflation that is continual issue for all and it also creates economic crunch in industrial sector. Though ministry of finance consoling Indian populace that there is no need to worry as effectual monetary policies are being made to curb this intricate problem, but public do not find solution as rates of all commodities are increasing day by day. Some finance representative affirmthat rupee fall is due to currencies have decreased in valueas compare to the U.S. dollar.These reasons are not digestible to public as well as other experts. According to Kuntal Sur, director for financial risk management at KPMG, rupee may remain unstable for short period as the Indian market is in worst phase. Presently, rupee value decreased to lower rate that causes instant worry for experts, investors and importers though exporters, IT companies gets benefit from deceleration of rupee. Indian exporters, for examplegiant software outsourcing companies TCS and Infosys may enhance sale through low rupee value because it would make their products and services inexpensive. Non resident Indians will get advantage from steep fall of rupee. They can make good investment or transfer funds to their Indian bank account. A weakening rupee means more value for every dollar NRIs send homeRBI is taking initiative for the stability of rupee and support Indian populace because banking the strength for the enhancement of Indian economy. The RBI increased the cost of borrowing under the marginal standing facility and issued bonds to increase dollar funds but still decrement trend continues. Government took numerous efforts such as focusing on foreign direct investment. Foreign assistance and FDI raises the current account shortfall. India has major problem in economic perspective that it imports more than it exports and there is a desperate need of foreign investment in India. 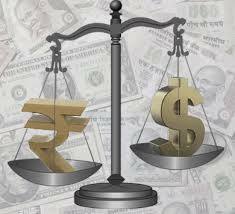 Many experts consider that foreign retailer’s entry in the nation can assist to control the rupee fall in long run. These huge companies are Wal-Mart, Tesco and Ikea invest money into the Indian market to establish new stores, warehouses and other services.